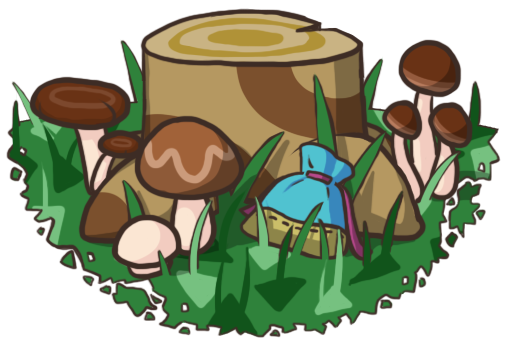 First, I’m just going to say that I’m abandoning all pretense that my goal is to catch up to the present in New Leaf as soon as possible. I don’t want to feel stressed and rushed when I play AC; I want to go at a pace I find enjoyable. 🙂 If that means my town’s still in winter when everyone else is in spring, so be it. 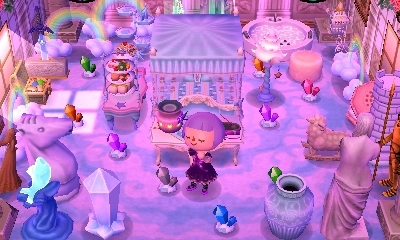 I’ve come to terms with the fact that this is just how I end up playing AC often these days, and to be honest, I don’t really mind my town not being on the correct date! And with that little announcement, I’m going to just jump in to the beginning of December in Citàlune: of new WiFis, new neighbors, and new sights of stunning auroras. After hanging out in my town a bit, we went to her town Bluebell. I decided to use the capricorn statues in the newly re-made main room in Estel’s castle! I liked the rainbow screen/sky room that was here before, but felt like it had run its course, and I was ready for something new. And I think this new room better matches the feel/theme Estel’s castle is supposed to represent—the castle of the moon and all that. Because I now have several lamps in the main room that give off blue light, the windows viewed from the outside have changed color as well! Before they were yellow, but now they’re an icy blue. I also made a winter backyard/garden sort of room in Violet’s house — nothing too special, but I think it’s kind of cute! Megan’s town is coming along great so far! The azalea bushes look so lovely in bloom around this fountain! ^_^ Thanks for adopting Biskit and having me over, Megan! After WiFing with Megan I found a new neighbor, Mitzi, in town! Well, I reset for her house plot to go in a half-decent spot for like 2 hours, so it wasn’t much of a surprise by the time I actually got to meet her. xP It’s a good thing I loaded with a new character that day; otherwise her house would’ve landed right in front of Lyra’s castle! Another WiFi I had recently was with Jessica from Sandy! 🙂 We did a trade: her tweeter, various hybrids, and perfect cherries in return for my ice vanity, blue roses, and perfect apples. After looking around some, we went to her town! Paula – an appliance, but she also said something orange. So an orange appliance?? The color-specific requests seem a little vague, like I’m not sure if they’d want clothes, furniture, wallpaper, or what. But yeah, hopefully I can figure out what they all want by Toy Day! December also means that the Jingle series is available. It’s definitely a cute festive series! And the gorgeous series as well, at GracieGrace! 😀 I haven’t bought the whole series (and I wonder if I should or not, since it’s so expensive), but I bought some pieces I thought would be fitting for Lyra’s library. Hehe, it’s about time! Julian’s been hanging out in my other town for a while now, and he finally packed up to get out of there! So it’s time to move him over to Citàlune. I reset for this house location for a long time, but after a while, started to wonder if it was too close to the cliff to be possible. 😦 I think it’s impossible, and I’ll explain why using grids, since all stuff like this (house locations, PWPs, flowers, etc.) is placed on a sort of invisible in-game grid. Feel free to skip over this if you’re not interested, lol. But maybe it could be useful to someone else out there who plans house locations. I visited a fair amount of dream towns after this to see if I could find a house close to a cliff/river bend that didn’t meet this clearance area, but all of them did. So I think my theory is correct, but I’ll keep an eye out for new info! In the end I accepted a house location for Julian to the right of Henry’s house. It wasn’t my first choice but it should be fine. Welcome to Citàlune at last, Julian! 🙂 He’s one of my dream neighbors I’m most excited about, since his appearance, house interior, and house exterior all seem so fitting for my town! Ooh, a notice on the bulletin board for a large snowstorm! I built two new streetlights by the path to Lyra’s castle, and I envisioned taking a commemorative photo of them at 6 PM with the lovely sunset colors, but because of the snowstorm it’s already quite dark! And of course, the next day my town was covered in a blanket of snow! Henry moved out recently and I put him on one of the adoption sites as usual. The girl who adopted him was really nice and said he was one of her top dreamies, so I’m glad he went to a good home! His house ended up exactly where Henry’s house used to be, and right next door to Julian. 🙂 Despite the house location drama I went into earlier, I think it’s turned out okay, since both their houses are bluish. 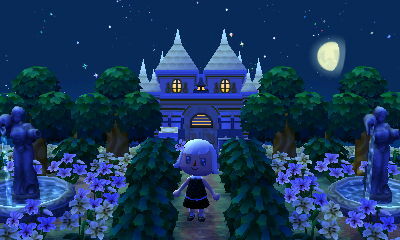 I’ll try to make a nice garden of blue and white flowers around their houses over time. 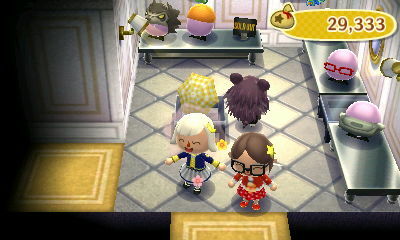 Posted on January 29, 2014 by Amy •	This entry was posted in AC:NL, AC:NL WiFi, Citalune and tagged Animal Crossing. Bookmark the permalink. Hey Twisk! I don’t know if you remember me, it’s been a long time haha. I used to play ACWW with you. I recently got a 3ds and New Leaf for my birthday, and would love to play with you and Kammile (if she’s still active) again. I’m still sorting out my friend code and stuff (it’s only been a day since I got it lol). Anyway, tell me if you’re up for a reunion! Great! I’m looking forward to WiFing again. I sent you my FC on ACC, and added yours as well. Tell me when you want to meet up! I’m in Texas now (lol) so there won’t be any huge time differences haha.